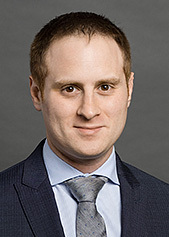 Richard Solow is an associate in Cadwalader’s New York office focusing on financial restructuring and bankruptcy litigation. He represents creditors and investors across a variety of industries in complex financial restructurings, including Chapter 11 and distressed municipal finance matters. Recently, Richard represented clients in the restructurings of the Commonwealth of Puerto Rico and its public agencies, Seadrill Limited, and Zohar III, Corp., among others. Prior to joining the firm, Richard was an associate at Fried, Frank, Harris, Shriver & Jacobson LLP and served as a judicial law clerk to the Honorable Peter H. Carroll, United States Bankruptcy Judge for the Central District of California. Richard received his J.D. and LL.M. in bankruptcy law from St. John’s University School of Law, where he served as an editor on the American Bankruptcy Institute Law Review. He is admitted to practice in New York and California and before the U.S. District Court for the Southern District of New York. St. John's University School of Law - J.D.